When I set out on this trip, I thought there would still be places where I could see what the Earth looked like prior to human impact. Sadly, I think I was wrong. Every place I have sailed has borne painful evidence of humanity’s maltreatment of the Earth. The coral is dying, fish populations are visibly low, and pesticides, sewage, runoff, and toxic pollutants fill the sea near populated areas. Everyday ships arrive with thousands of tons of imported goods to quench consumerist thirst and fill the landfills, ocean, and air with the by-product–>plastic. On 13th August, 2008, I attended one of the world’s more unusual dinner parties. A few hundred miles east of here, in the middle of the ocean, I boarded the JUNK Raft, a vessel made out of 15,000 empty water bottles, crewed by Joel Paschal and Marcus Erikesn of the Algalita Foundation. Like me, they were on the ocean to raise awareness of the North Pacific Garbage Patch. We had spoken briefly before we set out on our respective voyages, me from San Francisco and them from Long Beach, and agreed that we really should collaborate with our campaigns. But life became busy and we hadn’t gotten around to coming up with a strategy. Fortunately fate intervened. My watermaker had broken and I was running out of reserves. Their voyage was taking much longer than expected and they were running out of food. Suddenly a mid-ocean rendezvous became more than a nice-to-have. It became a matter of life and death. We met at around sunset that day, and they showed me a sample that they had collected. Even here, on the edge of the North Pacific Garbage Patch, they were finding that plastic outweighed plankton by a ratio of six to one. Then Joel the navigator harpooned a lovely big mahi-mahi for our dinner. Luckily it was in better shape than one he had caught a couple of weeks earlier. When they opened that one, they found that its stomach was full of bits of plastic. They knew enough to realize that this fish would not be good for eating, because of all the hormone disruptors and toxins that come out of plastic. So it went back in the ocean. This is a story that I often tell in my presentations. It has a bit of everything – a bit of drama in real life, ocean adventure, alas no romance with the hunks on the junk, no time for that – and it also has a message. It illustrates that plastic pollution is not just an issue out there on the ocean. It is a problem right here on our dinner plates. At the joint press conference that the Junk guys and I did at the Waikiki Aquarium after I arrived here, we issued a plea that people should stop and think before using a “disposable” plastic item. It makes no sense to make a disposable object out of an indestructible substance. I am currently based in Australia, preparing to row solo across the Indian Ocean, to complete my trilogy of Atlantic, Pacific, and Indian Oceans. Down there, in particular, 2011 so far has been a hell of a year. With the emphasis on hell. Australia has been clobbered every which way by flood and fire. Then there was the earthquake in New Zealand. Then, on a whole higher level of disaster, Japan. More earthquakes. Tsunamis. Nuclear meltdowns. We live in interesting times. From conversations that I’ve had, it seems that there is a rising consciousness that we have not been good stewards of this planet, and that it is starting to rebound on us. This is a good time to be talking about marine pollution. It is not necessarily the biggest issue facing our world today, but it is one of the most visible. It is difficult for many people to get their heads around climate change, or ocean acidification, or collapsing fish stocks. But ask them to picture how many plastic bottles, or bags, or coffee cup lids they personally generate in a year, and get them to multiply it by a lifetime, and by every member of their family, or by everybody in their city, or by everybody in the world, and you can see them start to wonder where it all goes. How come we’re not all up to our eyes in plastic? And this is how we can start to drive home this concept that on a finite Earth, there is no “away”. What goes around, comes around. I find it abhorrent that something that is in use for 20 minutes will be around for a hundred years or more. For me, personally, it has to do with the way that I came to environmental awareness. 7 years ago, in February 2004, I had my environmental awakening. Reading about the Hopi tribe of North America, I finally had my eyes opened to the blindingly obvious truth that we have to look after this planet if we want it to look after us. They believe that if we lose touch with our spirituality, with our connection to Nature, then we are flirting with disaster. Or more than flirting, we’re a dead cert. When I had this epiphany, I was shocked and horrified that I had been so oblivious. And so I took to ocean rowing as a rather extreme way to get a platform, to raise awareness, to inspire action and wake people up to the fact that if we don’t start recognizing the interconnectedness of everything, our complete and utter reliance on the Earth and all its systems, then we are, not to put too fine a point on it, completely up the creek. First, it is not as big as we think it is. What goes around, comes around. Since I had my epiphany, the US alone has generated 700 billion plastic bags, 150 billion plastic bottles, and lord only knows how much plastic silverware or coffee cup lids or bleach bottles. On my boat I am very aware of my inputs and outputs. Second, mother nature rules. There is nothing like facing 20 foot waves in a 23 foot boat to remind you who is in charge. We can flout laws of nature for a while, but ultimately, she runs the show. Third, we have to take responsibility. Every action counts. Every time we buy something, use something, or throw something away, we are casting a vote for the kind of future that we want. We’ve all been doing what we can, in our small ways. Personally, I’ve been involved in a campaign to make the 2012 Olympics plastic bag free. This year I’ll be gathering samples in the Indian Ocean to assess the amount of pollution. At this conference we have the opportunity to take that up a level, and to spread the ripples of change much further. We have a chance to influence policy, and set an agenda for the world. This is more than a quest to end the plastic peril. This is a spiritual quest. We have an opportunity to decide what kind of future do we want. This comes down to what we believe about the kind of future that we deserve. Are we amazing creatures, evolving towards our highest selves? We have been blessed with this thing called free will. Are we going to use it to save ourselves? And it’s about more than just plastic. We are going to face a multitude of such challenges. Plastic is a useful testing ground for a new, more collaborative approach, which we will need in order to tackle the bigger issues. Plastic has become a symbol of our throwaway society. Let’s move away from our emphasis on materialism, and instead place the emphasis on happiness. I wouldn’t mind so much if trashing the Earth even made us happy, but it doesn’t. Let’s return to simpler, more authentic values, the things that really make us happy, like good relationships, a sense of self-worth, a sense of peace. In these turbulent times we have an opportunity for change. Let’s seize that opportunity, and change course for a better future. We could be at a tipping point, as people see that the old paradigm isn’t working. A few tiny actions on our part could make all the difference. It took me 2.5 million oarstrokes to row the Pacific Ocean. Each stroke only took me a few feet, but added all together, they added up to something truly significant. Every action counts. Let’s pull together, and together, we can save the world. 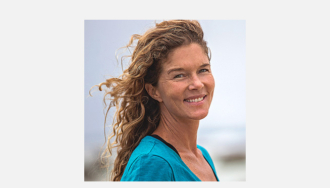 Editor’s note: This speech originally appeared on Roz Savage’s blog, in the post “Fighting the Plastic Peril.” Patagonia ambassador Liz Clark is back on her sailboat, Swell, “heading east.” Patagonia ambassador Mary Osborne also attended the International Marine Debris Conference having recently returned from a trip to study plastic pollution in the South Atlantic Gyre.